Shea nuts are grown and harvested across much of West Africa. It is a multi-billion-dollar industry, and the majority of the processing is done by women who get paid very little. 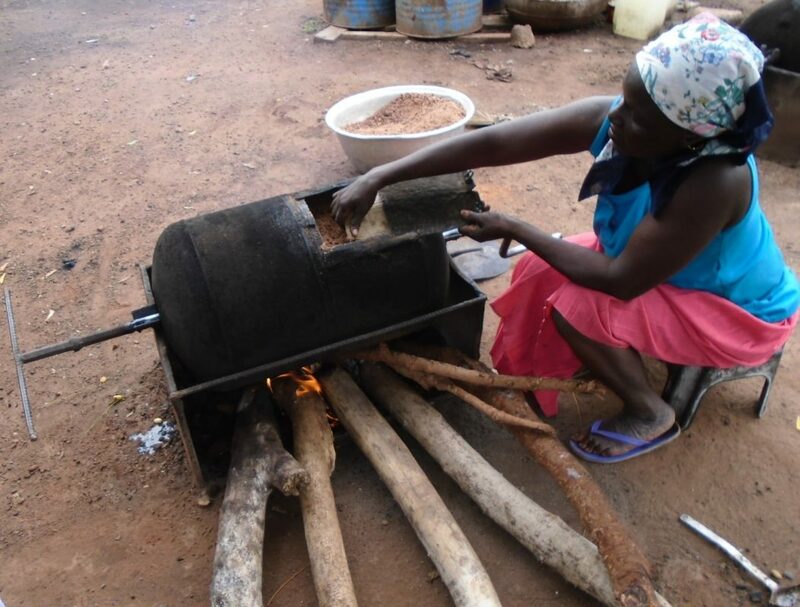 Additionally, the current process for roasting shea kernels needs improvement to address significant health and environmental shortcomings, including low fuel efficiency and high particulate emissions. Problems with inconsistent roasting quality were also observed. BDL has since partnered with Burro Brand Ltc., a Ghana-based developer and distributor of productivity-enhancing innovations. Together, BDL and Burro have applied for a $125,000 grant through Winrock International, which requires a 100% matching contribution for the $250,000 project: to develop an improved roaster. The project began on May 1st, 2018 and will last 2 years, consisting of multiple design and testing iterations in both lab and field to produce a quality product which meets the women’s needs. Goals of the project will include reducing wood fuel consumption by 40% and reducing particulate and carbon monoxide emissions by 90%. BDL is actively accepting contributions to this matching effort. Support the Shea Roaster Project today!